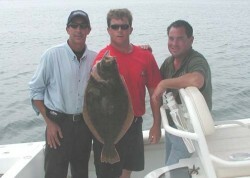 The August 4 fluke fishing (summer flounder fishing) visit to historic Montauk Point, Long Island was quite successful. 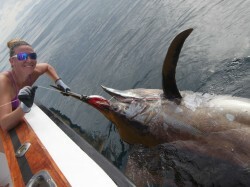 Andy and Rich’s guest, Capt. 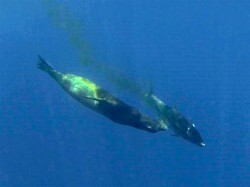 Joel Lizza of the Sea Otter Fleet, shows what it takes to target trophy Fluke in the deep water. Big seas and strong currents are no deterrent as the bite was on, the action rarely slowed and there were numerous double headers. 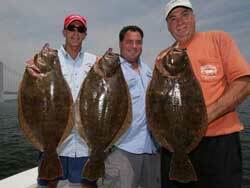 Rich, Andy and Joel really put their tackle to the test battling these fish and the conditions. 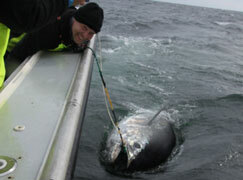 Nearly all of the fish were of legal size and several were in the 3-5lb range, with the largest at over 8 lbs. 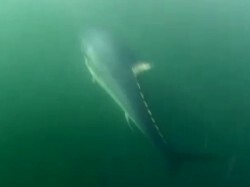 All of the fish were caught drifting at depths over 40 feet.